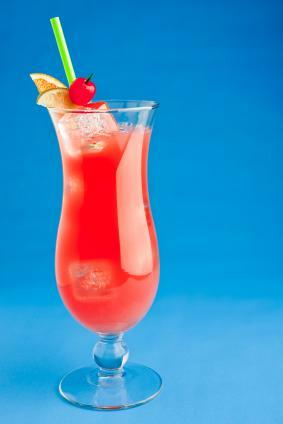 In a shaker with ice, combine the rums, juices, grenadine, sugar/syrup and shake for about 10 seconds. Strain the drink into a hurricane glass with ice. Garnish with the traditional orange slice and a cherry. You might also enjoy one of the following variations on the traditional Hurricane cocktail. Combine all the ingredients in a shaker with ice and shake for approximately 10 seconds. Strain the cocktail into a hurricane class with crushed ice. Garnish with an orange slice and a cherry if you like. This variation packs a fizz, as well as a wallop at the end. Combine everything except the 151 rum in a shaker with ice and shake for about 10 seconds. Strain the drink into a 15 ounce hurricane glass. Add the 151 rum by pouring it into the glass over the back of a spoon so it floats on the top of the drink. Use a straw to drink this cocktail from the bottom up. Here's yet another variation of the Hurricane. If you'd rather skip shaking your drink, you might enjoy this simple recipe from Bartending Bootcamp. This Hurricane recipe skips the passionfruit and relies on orange juice, cranberry juice, sweet and sour, and a splash of grenadine for flavor. The exact origin of the Hurricane cocktail is a bit of a mystery. However, according to the Field Guide to Cocktails, this drink was largely made popular by Pat O'Brien's French Quarter Bar back in the 1930s. Another bit of trivia from this same source is that the hurricane glass was created especially for this drink. The shape of the glass is reminiscent of the glass from a hurricane lamp. It's always a bit fascinating to learn how a single cocktail like a Hurricane can be mixed so many different ways by so many people, but that's the nature of cocktail making. You're always free to tweak the recipes a bit until you find a flavor combination that makes the drink taste perfect to you. Try the recipes presented here and see which one you prefer. If one comes close to your ideal flavor but isn't quite there yet, experiment with the recipe a little until you find a combination you love. Once you do, write it down so you can share your Hurricane recipe with everyone else.